Wonder Woman has been an interesting book since its reboot, and I have found it difficult to analyse given my lack of prior knowledge. What I can tell you is that the mythos of Diana has been rewritten and taken in a tangential direction. 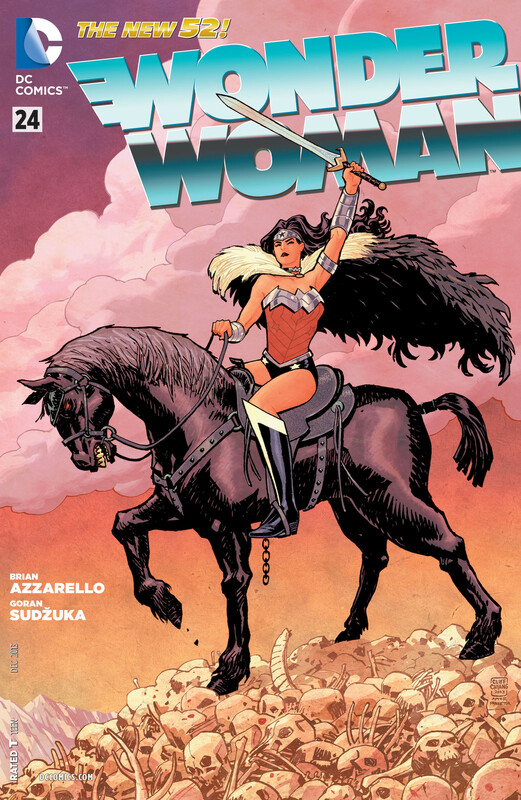 I would be quite interested to hear what loyal followers of Wonder Woman think about it, especially because this cover represents her latest myth. Diana looks fierce and dominant as she gestures with her sword held aloft her head. This is not overtly original but it is the surrounding effects that change her from being a warrior of truth to that of fear. She has a heavily feathered cloak which is coarse and matted flying in her wake. Her horse is dark with red grimacing eyes and scowling teeth looking genuinely terrifying. They tread ground littered in skulls and bones from all kinds of creatures, with a glorious orangey red sundown in the backdrop. This is not your honourable and noble Wonder Woman but one that has taken to a darker road. This reflects a fundamental change in her background and all that she knew has been refuted, leaving her crestfallen and despairing. She walks a path less trodden, she is the daughter of a deity, a sister of omnipotent beings and now the God of War. Next PostInfinity So Far – The throes of war! Wow, this is a brilliant cover! Love it!